Gerber Plumbing Fixtures has been serving the plumbing industry since 1932. When they started out, the company was small but today they have their headquarters in Illinois and they have manufacturing facilities in the United States, Canada and China. Since their first fixture the company has been dedicated to high performance, durability and quality products. The business is family run and they understand the importance of having products that homeowners would love to have in their home. One of their premier fixtures is the toilet. These days all of the great plumbing fixture companies are offering more efficient toilets, using less water and saving homeowners some money on their water bills. Gerber is no different. 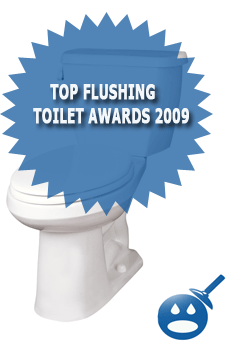 Gerber products are available in residential vitreous china, one of the strongest and most popular for all toilets. The company offers commercial plumbing fixtures, electronic faucets and flush valves. One of their products is the Gerber Avalanche Super Toilet; this toilet is one of the newest products in their Gerber family. Let’s see what the Gerber Avalanche Super Toilet has to offer. The Gerber Avalanche Super Toilet Model 21-824 is a Super Toilet that has a 17″ Ergo Height and a 14″ Rough In. This toilet was designed to help conserve water and be a bit more environmentally friendly than other toilets. 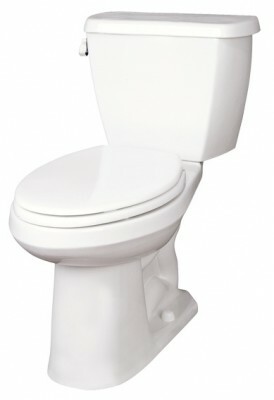 The Avalanche Super Toilet has a 1.6 gallons per flush system with a 1000 gram bulk waste removal. The Avalanche is made from Vitreous China, one of the strongest in the toilet manufacturing world. 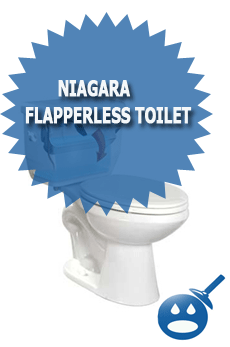 This Super Toilet comes with a Fluid Master 400A fill valve with a 3″ flush valve. The Avalanche Super Toilet from Gerber measures in at 18-1/4″ width x 31″ in depth and 30-3/4″ in height. The rim to water length is 5-1/4 inches. In addition to being regulation size, this toilet has a reverse trap and a glazed trap way for easy removal of waste. The idea behind a reliable toilet is making sure that it has a reliable flush and waste removal system. Without it, it just makes this toilet like every other one on the market. The Gerber Avalanche Super Toilet has all of the right specifications of making a toilet that not only removes waste reliably on the first flush but it meets the industry’s standards. Some of the benefits of using the Avalanche Super Toilet are that it does save water on flushing with on a 1.6 gallon per flush system. This toilet is designed with a modern and contemporary style so it will match any bathroom decor. It also is available in White, Bone and Biscuit. The water seal on this toilet is 2-1/2″. Though Gerber has a great reputation it is important to inspect the toilet before installing. Make sure after installation that you double check the nuts and bolts. If you don’t secure the toilet properly then you may lose some water, as it will leak at the gasket. This would defeat the purpose of conserving water with the Gerber Avalanche Super Toilet. When you order the Gerber Avalanche Super Toilet you will get the toilet, dual feed siphon jet. You will get the tank as well. The Super Toilet comes with step-by-step instructions on how to install it. If you follow the directions you can save you money by not having to hire someone to install it. This toilet is cost effective and is priced around $ 500.00 but depending on where you decide to shop, this toilet may be priced cheaper. Gerber products are available for everyone to buy. 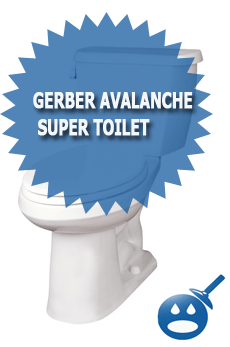 So if you like the Gerber Avalanche Super Toilet then contact your local plumbing supply store and get one today. Gerber is so sure of their products that they offer a 10-year limited warranty on the Vitreous China and Pressure Vessel and another 5 year limited warranty on the other parts. The toilet comes with a complete warranty package on how to register your warranty and what the warranty will cover. Gerber products are reliable, dependable and will last many years to come. The company offers their customers the best plumbing fixtures. They are always coming out with new products that are designed to save the homeowner time and money. The Gerber Avalanche Super Toilet is one of the newest in the Gerber line of toilets. If you are in the market for buying a new toilet, then check out the Avalanche Super Toilet, you will be very impressed with the specifications and the benefits. Your note above says gerber products “are available for plumbing specialists only.” Does this mean that I, as a homeowner teacher, cannot buy a gerber toilet and install it myself? Do I have to go through a third party? I am especially interested in the top-rated gerber avalanche (21-817) that gets great reviews from this month’s Consumer Reports. But it sounds like I can’t just buy one — I have to go through a plumber who would want to install it too. I live in Annapolis, Md. 21401. Gerber products are available to everyone. Our products are not available at large retailers such as Home Depot. Helen, as a homeowner and teacher, you can contact a local showroom that sales Gerber. The local sales rep in your area is below. Please let us know if you have any other questions. We’d be glad to help. Can I ask why you cannot buy your products as Home Depot & Lowes? Are Gerber Avalanche toilets available for sale in the Louisville, KY area? “Roughin” refers to the distance from the toilet hold-down bolts to the finished wall behind the toilet, right? say on the topic oof thuis article, in my view its really amazing in favor of me. гead it next mmy contacts ᴡill too. to find things to improve myy website!I suppose its ok to use a few of your ideas!! I do not know whether it’s just me or if everyone elsze encountering problms with your website. else please comment and let me know if thijs is happening to them as well? This may be a issxue with my browser because I’ve had this happen before.